Iranian Navy said it folded an attempt by pirates today to hijack an Iranian oil tanker in the Gulf of Aden. IRIN’s 28th Task Force was escorting the tanker when the pirates attacked, Fars News Agency reported. No further details were released. 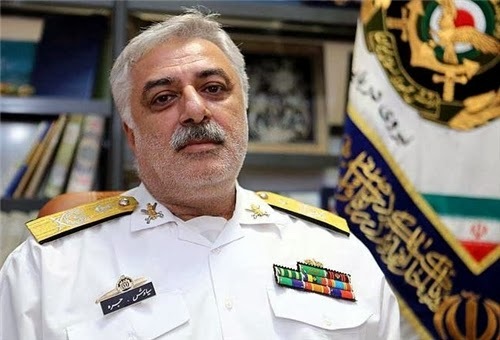 The Iranian Navy has been conducting anti-piracy patrols in the Gulf of Aden since November 2008, when Somali raiders hijacked the Iranian-chartered cargo ship, MV Delight, off the coast of Yemen. The Gulf of Aden - which links the Indian Ocean with the Suez Canal and the Mediterranean Sea - is a vital energy corridor. yes indeed, the Iranian military is able to defend Iranian interests from the Somali pirates. Scruffy unshaven and fat. Reminds one of another mullah. Ohh, so this "rusty and obsolete navy", according to MULLAH'S OPPONENTS OF THIS BLOG, is still able to be something useful. Of course they are able to foil pirate attacks...they were pirates themselves during the tanker war of the 80s. Real professional militarymen shave their faces everday, in peacetime, and in wartime whenever opportunity allows. A clean shaven face is a sign of discipline. In the old militaries, especially the Western ones (including the Imperial Shah Army), one would recieve some sort of punishment for being lax with ones facial appearance. The biggest pirates are the IOF in the mediterranean sea. A military Man is judged not by his looks!. too brainwashed you Guys! - @-And anon -Jan 8 at 6:58pm "scruffy unshaven and fat. reminds you of another Mullah"
you have a small demon of racism in your head! and you need to throw it off or run away from it!- earlier the better!. what is the definition of racism mr blackman adam? The one who plays the racism card is you moron not Iranians. Iranians can call other Iranians backward. They can call their culture miserable. However, they cannot call a nigerian a master of credit card fraud as it will be labelled as racist. The world is full of people like you that in every opportunity cry wolf for no reason. Find asn Iranian is crazy enough to join a forum related to dark continent. The answer is none. All thopse guys can do is beat their chest or cryf racist. That is the reason they are the most backward peopple on earth. I am sure many in this forum wonder what this bouzineh isd dooing in this forum. The answer is he is paid by somebody to put this cabaret act in here. Pretending to be an Iranian does not work, your racism betrays you. Thank you Anon 12:52 AM. You are right. Anon 8:24... I'm more Iranian than you ever be. The only people "iran bashing" are the crazy mullahs and their little minions. Sure they are . And Khamenei's regime runs on the principles of Mohatma Gandi. The Israeli's did the right thing. Because that ship shouldn't have been in Israeli waters without their permission. Islamist terrorist regime attacks camp Ashraf in Iraq and kills Iranian exiles abroad. These are the signs of a true terrorist run state. So according to zionist logic, piracy is okay when they do it to a ship not in their waters, just not for others to do. A case of do as you say, NOT as you do. Who are you to judge Iranians? Who are you to be racist to anyone? Who are you to question Iranians? Iranians are not being questioned here. zionists are. Non Iranians like you have no right to tar Iranians with their ideological nonsense. zionists also, have no right to tar Iranians. Agreed Anon 3:42 PM... Obsessive "zionist" lovers like you have no right to tar Iranians with their ideological nonsense. "zionist" lovers? Is that meant to be clever? http://www.allmystery.de/dateien/,1294475295,dxqq4O_19274_tumbleweed.GIF The zionists on this site are clear to see and hypocritically try to tar all Iranians with their racism. Anon 6:49 PM.... "Zionist" and "racism" lovers such as you are indeed clear for Iranians to see on this site. The only commenters showing love for zionists on this site are those that also anti-Iran and anti-black people. Anon 5:36 PM.......Silly comment made by anti-Iran "zionist" loving "racism" person with identity crises,that tries to mix issues which have no relevance to Iranians. Love of zionism is clear to see from those who are also anti-Iran and anti-black people. I've been reading some comments here by other anons and can honestly say anon 5:36 pm comment regarding "anti-Iran" & "anti-black people" as being nonsense. If I'm not mistaken Iran is an central Asian country and not placed anywhere near or inside Africa.We have problems with the regime in Iran but were does "anti-black people" come into it?? Please stop your childish diatribes and insulting Iranians with your mis-placed nonsense. Anon 10:55 am sorry to say this but don't bother wasting your efforts on dead beat anons who have no clue what they are saying. Otherwise good luck. Anon 4:17 PM.....I have come to the conclusion you are black man adam using Anonymous as cover. Please address your concerns to Nigerian affairs because that country needs serious seeing too. Anon 11:24 PM further proving the anti-Iran and anti-black people attitude of zionists. Racism being a fundamental part of zionism is why zionists attack and discriminate against African people and practise segregation against Palestinian people. I have proved that you are a foreign agent by the name of black man adam and using Anonymous as cover.You really should stop your daily diatribes against Iranians and concern yourself more with Nigerian affairs and let us Iranians worry about our own problems regarding our own country. There is still no proof of any kind, from you. Just words. The real diatribes against Iranians come from those commenters who use this site to make remarks that are against, stereotype and threaten Iranian people and Iran. Those commenters are also the same ones who take every opportunity to defend and promote zionists.